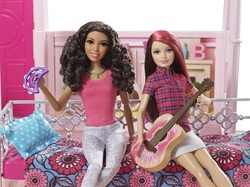 Be at home with Barbie this Christmas, with the Barbie My Style House. With the Starter House, girls can express their own signature style, choosing how they want the home to look and the stories they want to tell. ​With a vibrant selection of furniture and accessories, sold separately, girls can decorate the space to suit the story they are telling. This two-story house has four rooms with backdrops to help set the theme for each room. The first floor has a kitchen and living room; the second floor features a bedroom and bathroom; and a white staircase. To add a touch of glam, a pink chandelier decorates the living room. Girls will love furnishing, arranging and rearranging pieces to tell their stories their way. ​Select vibrant furniture and accessories from Barbie doll's designs to suit any style for the Starter house. House has working door, staircase and chandelier.